Like early morning light, or the first appearance of the stars, this pullover is a breathtaking moment, captured in a net of cables and fading colors. Choose three tones of Rios in the same family and fade them into one another to create an atmosphere all your own, or knit this piece in a solid color for a beautiful, fitted pullover with elegant cabling. Designed to be worn with 2-4" (5-10 cm) positive ease. Sample is the smallest size, model has a 34" bust. Malabrigo Book 10: Rios Patterns - Silicon Alley - PDF DOWNLOAD and Malabrigo Book 11: Aniversario Patterns - Waverly - PDF DOWNLOAD are both similar patterns: adult pullover garment, for women, worsted (19-20 sts/4 in) yarn gauge, and malabrigo rios suggested yarn. 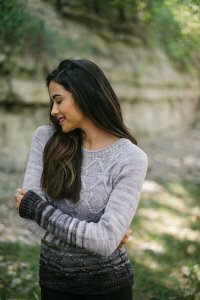 You may enjoy taking a look at the Malabrigo Rios Arrebol Pullover, Malabrigo Silky Merino Colmena Pullover, and Malabrigo Mora Avante Tee kits all using Malabrigo Heritage Collection Patterns. Hopefully our suggested yarn options for Restitos - PDF DOWNLOAD can help you come up with your next exciting new project idea!